Well HELLO, my loves! I’m still here! I haven’t fallen off a cliff or moved to the middle of nowhere with no internet I PROMISE. Just took a break from blog land for a little while. But I did miss you, and I have to admit I have that guilty feeling in my stomach that I get when I haven’t called my mother in waaay too long. I know we’ve all been there. 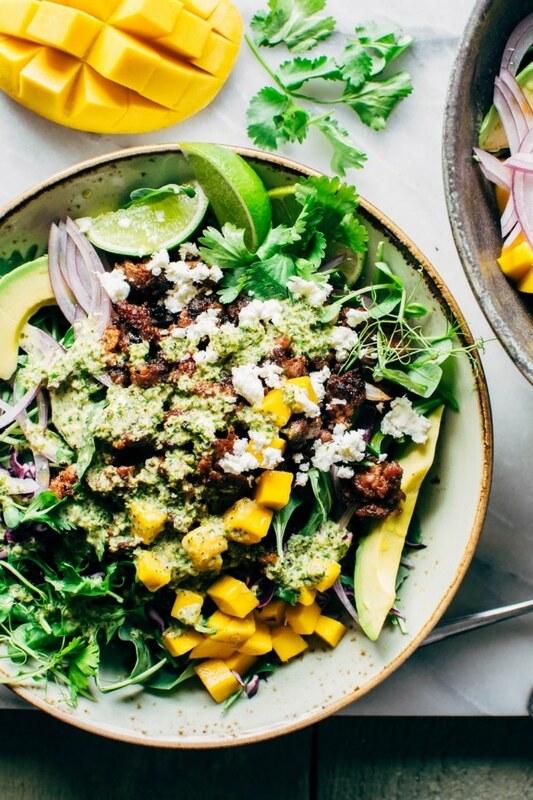 Maybe we can make it right with by sitting down with this some of these mango chorizo taco salad bowls with green sauce. Anything topped with green sauce usually makes things right. Galavanting around to the soundtrack of our favorite bands was so fulfilling and just the kind of magic that I needed to feel like I had really had a SUMMER. 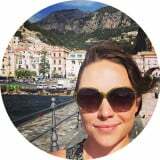 Sitting inside every day on a computer and then going inside to work at the restaurants was starting to feel too predictable and even a little stifling. Just the very fact of not picking up my cell phone for FIVE DAYS STRAIGHT was incredibly liberating, and really put me back in touch with the person that I am without all the filters and perfectly edited captions. I felt soooo much love surround me in the last two weeks and it was pure, raw, maybe-haven’t showered-in-a-little-too-long Nyssa, and it was so affirming and self realizing. It sounds a little cliche, but summer festival season always fills up my heart and soul in a way that nothing else can, and this year did not disappoint. 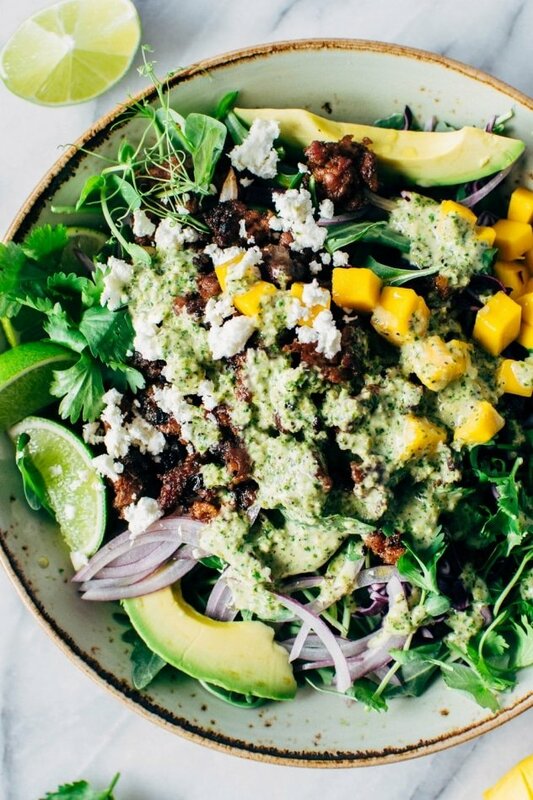 But I do have to admit that this mango chorizo taco salad bowl with green sauce is a pretty great thing to come home to, and I hope you’ll think so too. When I was a little girl I was kind of obsessed with taco salad bowls. The unhealthy kind. The kind that now make me cringe to even think about eating them. But I feel no shame in coming back to my childhood love of these bowls in THIS portrayal. I’d like to consider these bowls the healthy version of my childhood obsession. They’re packed with a rainbow of vegetables, and assembled in a matter of minutes once the chorizo is cooked and the green sauce is made. 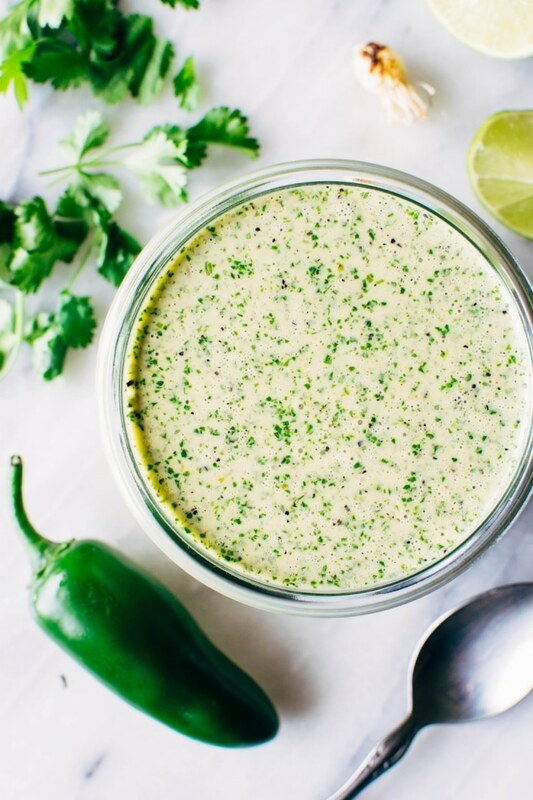 And speaking of the green sauce – once you try it you’ll probably always have a jar on hand in your refrigerator ANYWAYS so that part of the equation will already be taken care of. I mean, take a look at all those ingredients and try to tell me you’re NOT going to love this sauce. 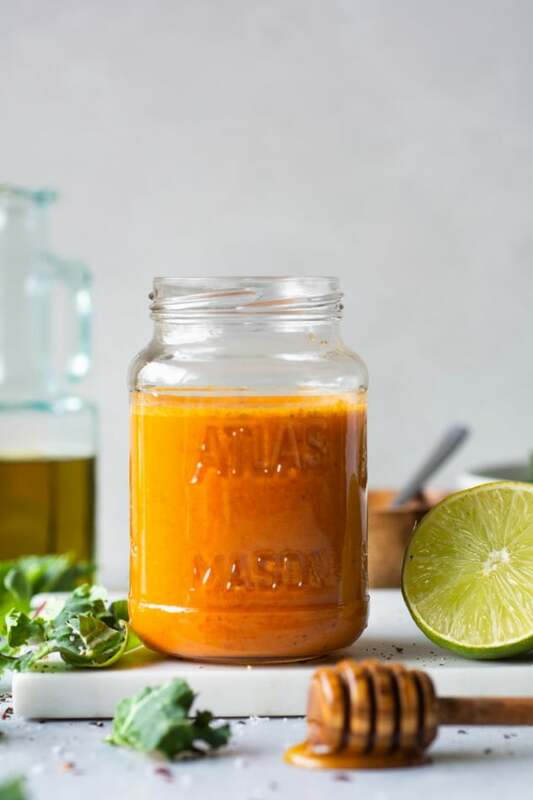 I have posted a version of this green sauce here on the site in a post from a long time ago, and the original inspiration for this particular sauce can be found in the cookbook by Tara over at Seven Spoons. To put it simply, I have made so many jars of this green sauce through the past few years that it’s sort of infamously associated with our house. We took a jar all the way to California with us to a music festival (because breakfast tacos + green sauce + camping = life), it’s been to birthday parties, house warming parties, and when my roommate spilled a brand new jar all over his shorts he said the tragedy was not the loss of the shorts that never got clean, but the sauce that was lost on them. That’s big love, guys. Bottom line, it’s amazing and you should make these taco salad bowls simply as a way to introduce this magic stuff to your house, too. Cook + crumble your favorite chorizo sausage with some finely diced onions – YUM! Top with chorizo + green sauce, crumbled feta and SERVE! Want more easy grain free salad recipes? Check out these favorites! 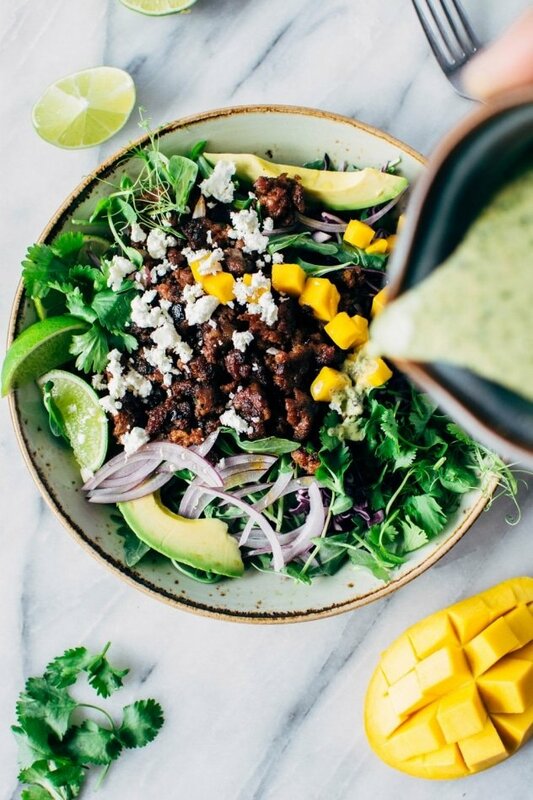 Mango chorizo taco salad bowls with green sauce! 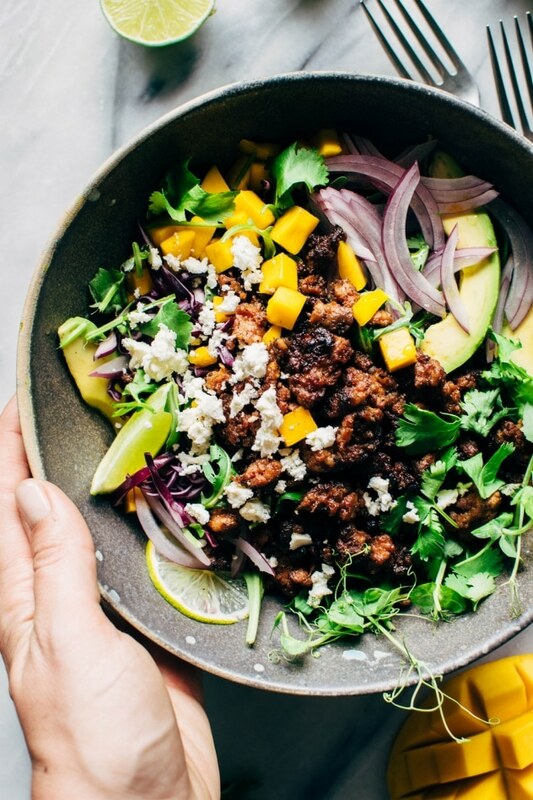 Spicy crumbled chorizo layered over salad greens with a rainbow of veggies and all your favorite toppings. 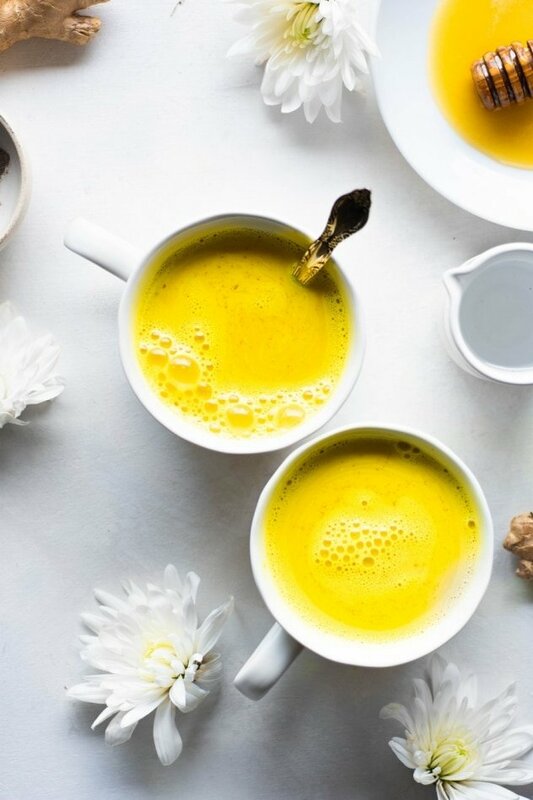 Heat cast iron skillet over medium high heat with 1 tbsp avocado oil, ghee, or coconut oil. Add finely diced onion and pinch of sea salt to pan and cook for about 6 minutes, until soft and starting to brown. Move onions to the edge of the pan, creating an empty circle in the center of the pan. Add chorizo sausage and press into a flat disk. Allow to cook for several minutes, untouched, to promote a nice brown crust. 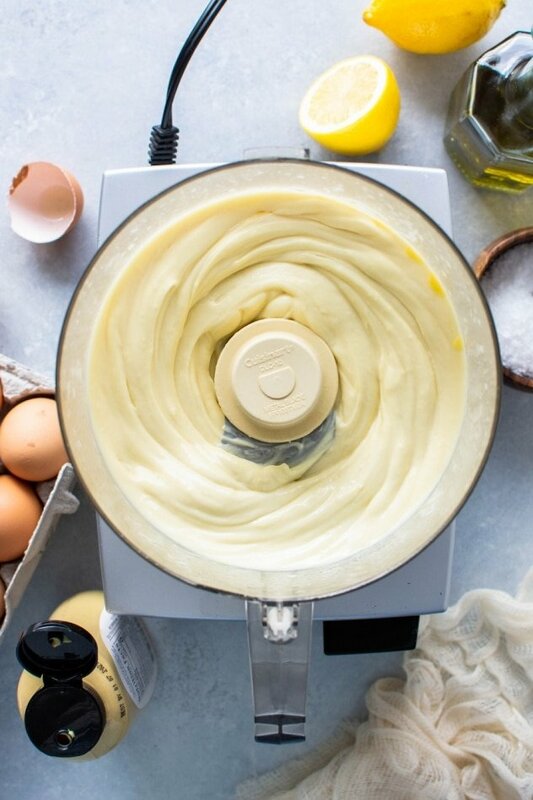 Flip as best as you can, and press into the pan to repeat on the opposite side. Once both sides are fairly brown, break up the meat with spatula and mix in the onions. Continue cooking until cooked through and well browned – about another 4-5 minutes. Season with a squeeze of lime juice and set aside. Heat a cast iron skillet to medium high heat. Wash and dry the jalepenos and green onions. Cook until deeply charred, and the peppers have started to soften. Keep in mind that the green onions will cook faster than the peppers. 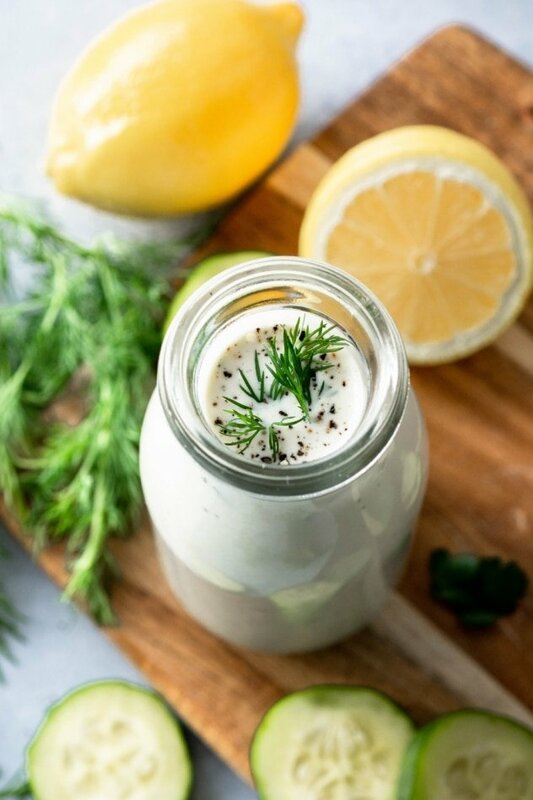 Add yogurt, mayonnaise, lime juice and zest, cilantro, olive oil, white wine vinegar, and paprika to food processor or blender. When green onions and peppers are slightly cooled, cut green onions into 1 inch pieces and cut away flesh from jalepenos. 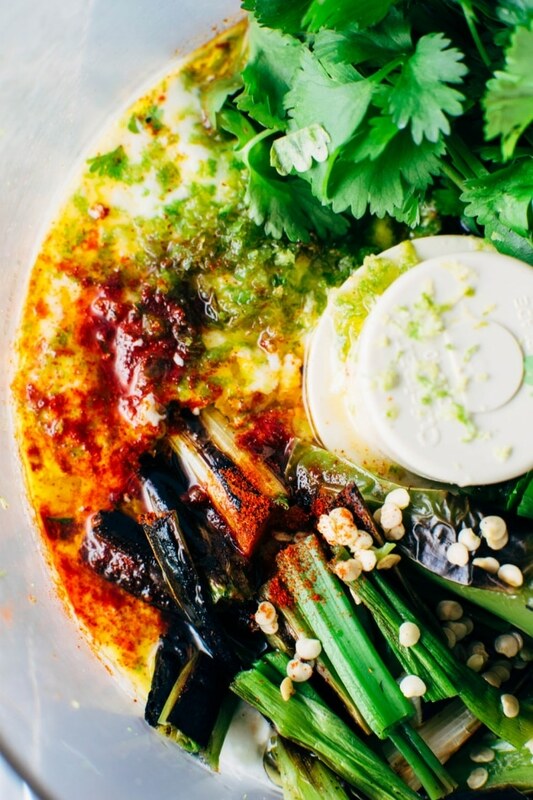 You may include some of the seeds for a spicier version! Process until smooth, season to taste with salt. 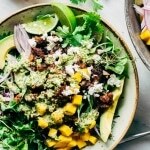 In 4 small bowls or one large bowl layer salad greens, cabbage, mango, red onion, cilantro, and avocado. Top with crumbled chorizo, green sauce, and feta cheese if desired and serve! 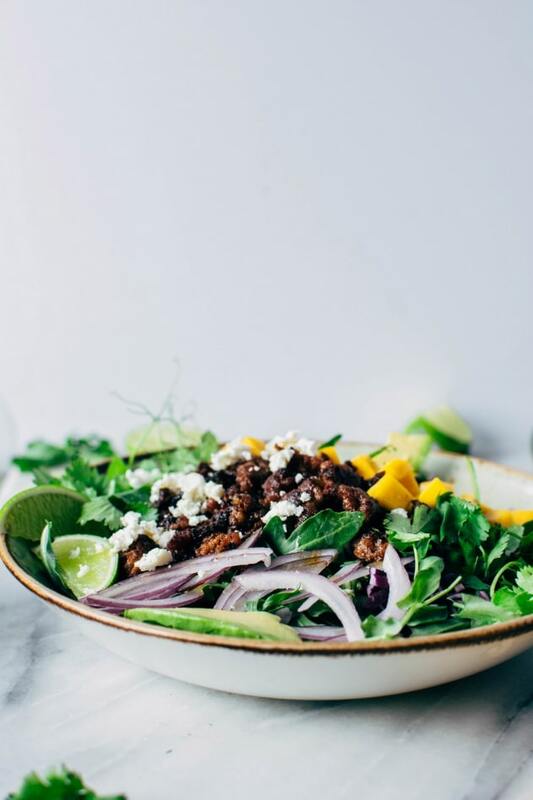 This entry was posted in dinner, salads and tagged chorizo, dinner, easy, gluten free, grain free, green sauce, healthy, nyssa, nyssa's kitchen, pork, quick, salad on August 16, 2017 by Nyssa Tanner.